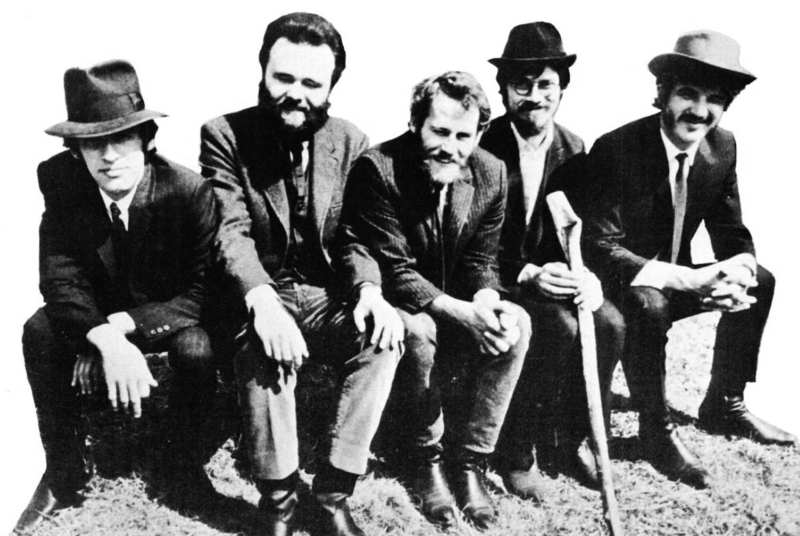 The Band was a Canadian-American roots rock group formed in Toronto, Ontario in 1968 by Rick Danko (bass guitar, vocals), Garth Hudson (keyboards, saxophone), Richard Manuel (keyboards, vocals), Robbie Robertson (guitar), and Levon Helm (drums, vocals). The members of The Band first came together as they joined the rockabilly singer Ronnie Hawkins’s backing group, the Hawks, one by one between 1958 and 1963. In 1964, they separated from Hawkins, after which they toured and released a few singles as Levon and the Hawks and the Canadian Squires. The next year, Bob Dylan hired them for his U.S. tour in 1965 and world tour in 1966. Following the 1966 tour, the group moved with Dylan to Saugerties, New York, where they made the informal 1967 recordings that became The Basement Tapes, the basis for their 1968 debut album, Music from Big Pink. Because they were always "the band" to various frontmen, Helm said the name "The Band" worked well when the group came into its own. The group began performing as The Band in 1968 and went on to release ten studio albums. Dylan continued to collaborate with The Band over the course of their career, including a joint 1974 tour. The original configuration of The Band ended its touring career in 1976 with an elaborate live ballroom performance featuring numerous musical celebrities. This performance was filmed for Martin Scorsese’s 1978 documentary The Last Waltz. The Band resumed touring in 1983 without guitarist Robertson, who had found success with a solo career and as a Hollywood music producer. Following a 1986 show, Manuel committed suicide. The remaining three members continued to tour and record albums with a succession of musicians filling Manuel’s and Robertson’s roles; the final configuration of the group included Richard Bell (piano), Randy Ciarlante (drums), and Jim Weider (guitar). Danko died of heart failure in 1999, after which the group broke up for good. Helm was diagnosed with throat cancer in 1998 and was unable to sing for several years, but he eventually regained the use of his voice. He continued to perform and released several successful albums until he died in 2012. The group was inducted into the Canadian Music Hall of Fame in 1989 and the Rock and Roll Hall of Fame in 1994. In 2004 Rolling Stone ranked them No. 50 on its list of the 100 greatest artists of all time, and in 2008 they received the Grammy Lifetime Achievement Award. In 2004, "The Weight" was ranked 41st on Rolling Stone’s list of the 500 greatest songs of all time. In 2014, The Band was inducted into Canada’s Walk of Fame.